We provide our clients with a full range of intellectual property services relating to trademarks and brands. These services include, but are not limited to, analysis, licensing, litigation, monitoring, and prosecution. Trademark Analysis and Opinions We meet with our clients to review all material for which trademark protection is sought. We then provide our clients with an in-depth analysis on the trademark protections available for the particular materials. This may include common law trademark protection already existing or registration with appropriate state trademark offices or the United States Patent and Trademark Office ("PTO"). Where trademark protection might not be available for certain materials, we explain to our clients the reasons as well as the likelihood of success in obtaining registered or protectable trademarks. In addition, we provide our clients with recommendations and methods to increase the protectability of the particular marks. Trademark Licensing - We provide our clients with complete trademark licensing services. Where our clients seek to use a particular work subject to another's trademark, we gladly facilitate, where possible, the license to enable such use and negotiate the relevant terms relating to such a license. Similarly, where others seek to use the works of our clients, we facilitate and negotiate the profitable license of our clients' works to others. Where our clients wish to sell or purchase intellectual property assets, we negotiate these transactions on behalf of our clients. Trademark Monitoring We monitor our clients' trademarks to protect against infringement. Where such infringement does occur, we actively and aggressively pursue those responsible (see IP Litigation). Trademark Prosecution When trademark registration is sought at either or both the state and federal levels for particular materials, our experienced attorneys prepare and submit the appropriate applications working with the clients to ensure all requisite information and exhibits will be properly submitted. Registration is critical to establishing protections of goodwill in brands and marks. We possess extensive experience in filing applications to register trademarks with the United States Patent and Trademark Office ("USPTO"). Before filing the trademark applications, we work with our clients to understand the brands and marks they seek to protect. We develop a strategy for completing the applications to provide for the broadest protection while providing the best opportunity for registration. Unlike other aspects of intellectual property, registration of a trademark with the USPTO is not guaranteed. For this reason, a thorough discussion with legal counsel should take place before initiating the registration process. Registration After the analysis and client confirmation to proceed, registration occurs electronically and quite efficiently. After electronically filing the application, our firm monitors the application as it works its way through the USPTO and the decision of the Examining Attorney assigned to the application. Contact one of our attorneys to discuss additional information about trademark registration. At times, the USPTO will issue office actions in relation to an application that require a response or resolution of issues identified. In certain circumstances, the USPTO might identify conflicts with the mark that may require negotiation with third parties. Our firm works with our clients to make every effort to resolve these issues. In addition to applications we file, we also represent clients who need representation in responding to an office action filed prior to our involvement. Should an application pass analysis by the Examining Attorney, it will be published for opposition. Anyone who believes the mark should not be registered may file an opposition to an application. Our lawyers represent our clients in responding to filing opposition proceedings before the USPTO. Our attorneys also represent clients in cancellation proceedings before the PTO. Where registration does occur, our firm follows the deadlines for our clients to maintan registration. In the Internet age, a business must engage proper domain name and trademark clearinghouse protection efforts. Our firm has a long history of working with our clients to develop a strong and sound domain name protection policy. We work with our clients to effectuate protection through the Trademark Clearinghouse. Maintaining rights to brands and mark necessitates a policing policy. Beyond registration and domain protection, a trademark owner must implement effective policing policies. Our firm can provide policing protection of marks through a variety of mechanisms. Where an individual or entity unlawfully uses a client's brand or mark, our firm works with our clients to immediately address infringement. Through a variety of tactics, we can enable our clients to implement a personality to enforcement efforts. This "personality" coincides with business and public relations considerations to implement an individualized approach to mark and brand protection. Litigation can serve as a strong, viable tool for mark protection. As a resource within the arsenal of tactics used to combat trademark infringement, litigation can be very effective to protect trademark and brand rights. Federal law provides strong protection to owners of trademarks, particularly those registered with the USPTO. This includes traditional actions under the Lanham Act and the more recent Anti-Cybersquatting Piracy provisions. Our firm has represented clients in intellectual property litigation in various jurisdictions across the United States. On behalf of our clients seeking to protect their brands and marks, we aggressively pursue litigation against infringers. On the other hand, we vigorously defend the interests of those who have been named as defendants for the lawful use of words that do not enjoy trademark protection as well as fair use of trademarks. 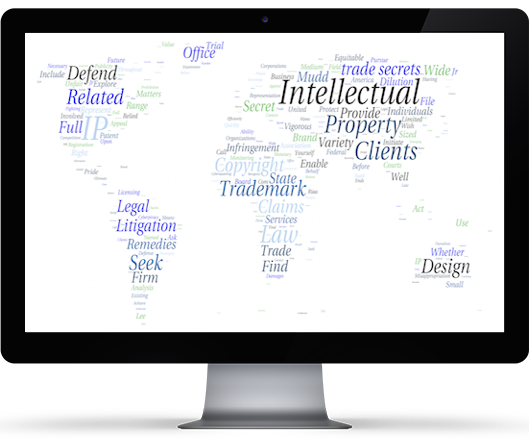 Looking for a firm who understands trademark law? Our team brings diverse perspectives to developing strategy to protect the interests of our clients and their businesses within the realm of trademark law and protection.